← here’s a combo: taxes and layouts! Tonight’s a crop night over at Our Paper Place, and I’m super excited because it’s a full house. I love spending time with my customers and their creative spirits because everyone inspires each other when they’re here. That’s what I love about this art — creative sharing! 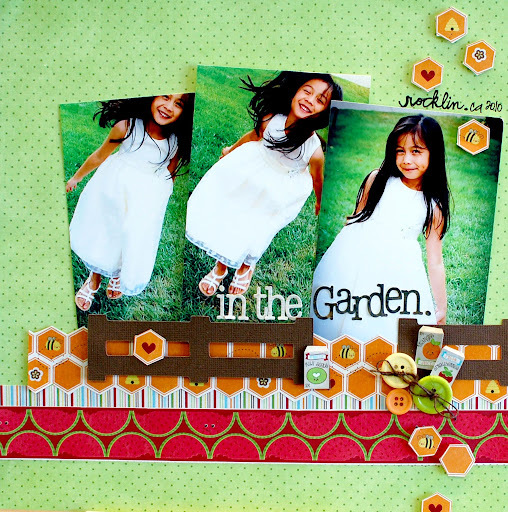 I think my favorite part about this layout are the honeycomb cut-outs that I placed all over my layout. Super cute, right?! …and I still can’t get over how teeny tiny those seed packets are. I love ’em! I took pictures of my succulents this morning. Take a look! aww! i’m glad that you are lovin’ it! i’m lovin’ it too! 🙂 it’s fun to blog. So gorgeous! I wish I lived there ~ I would be there in a hot second! oh i am loving this! all the green…beautiful! You have so many fun things going on at your shop, can’t wait till I have a excuse to stop over in sunny CA to see more.